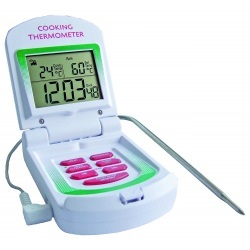 Be Cool this Summer, get a Thermapen with Air Probe! When occasionally British summer temperatures soar and the comfort of your office offers no comfort at all, many of us look to our air conditioning (A/C) for help. But when A/C doesn’t seem like it’s getting the job done, a Thermapen with air probe (231-214) might just be what you need to survive a heat wave! 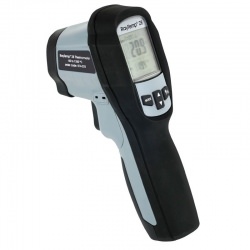 Air probe Thermapens are great, in that they have the capability to make quick and accurate assessments of hot and cool zones throughout the workplace. They can also give you a clue into what your A/C is (or is not) doing. They can also be used to detect air leaks, hot air ingress around doors, windows, and other areas that are a major energy waste. Hot areas or warm draughts existing near doors or windows, will increase temperatures. A Thermapen thermometer can help identify temperature differences and help you know which areas need to be investigated to determine the cause of any difference. Your Thermapen Air Probe will quickly give you accurate readings of your air intake vent, diffuser vent (where cool air escapes), and surrounding walls. In a matter of seconds, this thermometer can give you a good indication of what’s happening with your cooling system. When taking air temperatures with any thermometer, avoid areas that are directly influenced by heating elements or lights. The warmth from these fixtures can distort otherwise accurate temperature readings. Keeping offices comfortable for employees is virtually impossible, since “comfortable” in terms of temperature means something different to everyone. However, we also know that both cold and hot working environments can affect productivity. And this, ultimately, is why office temperature matters. So if you want to be cool this summer, then you should check out your air conditioning with a Thermapen!